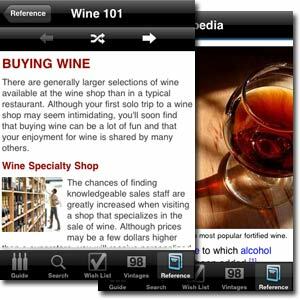 This week Wine Enthusiast (WE) jumped in the iPhone/iTouch app market with a wine app of their own. 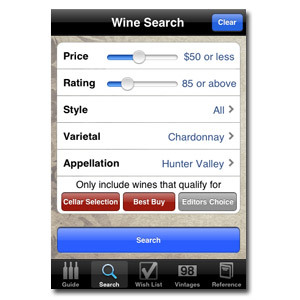 For $9.99 you can download the app that will give you access to all the wine reviews in the Wine Enthusiast database, vintage charts, a very in depth wine glossary and more. The interface for all the features is nice and very user friendly. The search function of the database allows you to choose from a variety of things from vintage to appellation. Great tool if you need help shopping especially if it’s for someone else who doesn’t like the same things you do. If you plan ahead, you can use the virtual shopping list that the program has so when you get to the wine shop you know exactly what you need to get. Even for a wine geek there are some things you just don’t know or can’t remember, having a wine dictionary in your pocket is quite handy when someone asks what the consejo regulador is. I like the vintage chart because again it is hard to remember what the season was like in the Columbia Valley in 2002. Of course the ratings for the vintages are subjective and based on the judgments of the WE writers, but it can definitely help you out in a pinch when staring at a wine list. The only problem with the vintage info is that it doesn’t list any information for Virginia! L Boo! Overall I think it is a fun wine tool but $9.99 may be a bit much. Wine Spectator has their mobile app which basically opens up Safari and logs you into their site, and only works if you have an online account. WS also doesn’t have the glossary or the Wine 101 features either and an online account for WS is much more than $9.99. My biggest unfilled need with the program is that it doesn’t have the option to record tasting notes. 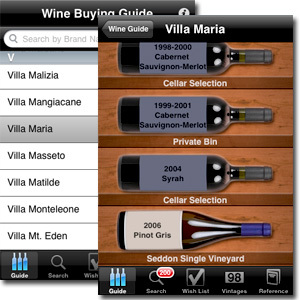 So I still need to use my other app Wine Snob ($4.99) to record tasting notes and bottle information. The Wine Snob program also has a glossary and pairing dictionary but the glossary isn’t nearly as in depth as the WE app. Don’t you hate it when you get purple lips and teeth after you have visited a few wineries? I got an email from this company Wine Wipes that has the solution for you. It seems they are marketing primarily to the ladies with their compact style carrying case, but it seems like a cool gizmo for any wine lover. Apparently the wipes are coated with Orange Blossom that does not affect the perception of wines that are tasted post use (wouldn’t everything taste orangey?). Recommended use for lips, teeth and even tongue to refresh your palate for the next swirl and sip. And the little case even has a mirror in it to check your mug and make sure you are all nice and clean. Gimmicky I know but it seemed cool, and definitely something my wife would use and at $7 for 20 wipes it isn’t too expensive. What type of stemware do you use, and does it matter? We here at the Witherspoon house have a mixture of Spiegelau and Riedel glasses for red and Spiegelau only for the whites. The red are the Bordeaux model and except for the actual stem of the glass you couldn’t tell the difference between the two visually. (Except for the etched logo on the bottom) I know internally, the companies use different crystal weights and mixture percentages that they both define as being the best. Recently we have become more and more amazed with nice restaurants that use small goblet shaped wine glasses, especially for red wines. A friend asked me the other day if I would consider myself a wine snob and I said no just an enthusiast, but when it comes to stemware I would say yes. The stemware can really change the wine experience for me both at a restaurant and at a tasting room. I don’t care about brand names, but when a tasting room/restaurant has nice, “properly sized” stemware I think it makes a difference in my overall experience not to say necessarily on the taste of the wine. Scientific studies have been done examining this very concept and found that when you take away the visual and tactile stimuli, negligible difference is found between the typical goblet style and the “proper” Bordeaux style Riedel glass. When you leave in the aforementioned stimuli there are significant differences between the glass types. Okay, Wine Bloggers, let me know what YOU think!! There are a few products on the market that claim they can smooth out tannins, evoke fruit character and generally “open up” a young wine in a matter of minutes. There are a lot of skeptics out there that say the gizmos don’t do what they claim to. But aren’t these devices just high tech decanters. I guess where a decanter and one of these gizmos differ it that the gizmo works in a matter of minutes, a decanter may take several hours or even a day to open up a bottle of wine. And I definitely don’t think you can age a bottle 5-10 years by putting it in a decanter which some of the gizmos claim they can do. I love technical gadgets so don’t get me wrong, I think these “wine agers” are really cool, but I definitely find something more enjoyable about watching the wine gently flow down the inside of a decanter vs. slapping a magnet on the neck of the bottle. This post was “sparked” by an article about one of the gizmos on winebusiness.com. Check it out HERE. If any of you out there that read this blog have one of these gadgets let me know how well and if it works.